Golturbuku Bay from Hilton Bodrum, with its private beach and island, sits on the calm Aegean Sea. Photos by Tanya Lara. Sun worshippers at Ersan Resort & Spa. Two seasons after being in Bodrum, I still find myself dreaming of the place. Of the blue Aegean Sea dotted with yachts, their sails looking so white against the sparkling waters, the breeze that cools down hot summer days, beach loungers spread out across the sand in every private resort or public beach, and the fantastic food. Widely regarded as the French Riviera of Turkey, it’s an hour’s flight from Istanbul and located in Mugla Province. Often referred to as a party island, the port city of Bodrum sits on the southern coast of Bodrum Peninsula and faces the Greek island of Kos. Sami Bas and Tanya Lara wait for sunset on Rabbit Island in 2015. Before this trip with Sami, who’s based in Istanbul, Bodrum was in the news nonstop. A little Syrian boy wearing a red T-shirt had washed up ashore trying to cross to Greece with his family and other refugees. The picture of the little boy so shocked the world and somehow made it more compassionate toward the plight of refugees. 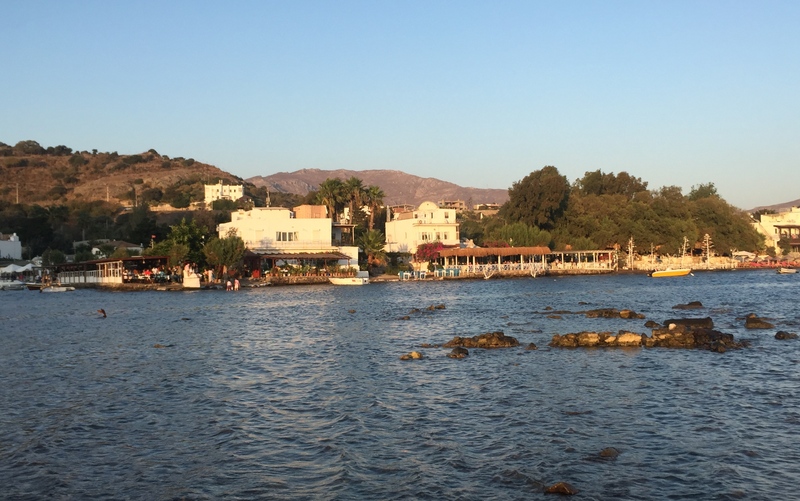 This is the Bodrum we find ourselves in at the end of summer 2015, at the crossroads of its hedonism and conscience — and these two roads would quickly merge because Turkish people are kind and compassionate (the country has two million Syrian refugees within its borders). The rest of Europe, it seems, is just beginning to realize this. You see a few refugees begging in the city center or selling pens at stoplights, but you don’t see the ones trying to cross to Greece because they do it under the cover of darkness and because of military and police presence on the streets, which was unheard of until the war in neighboring Syria exploded and crossed borders. The public beach in Gumbet, just a few minutes from the private islands near Bodrum City. Formerly belonging to Greece, Gumusluk island still bears the colors of the Greek isles. 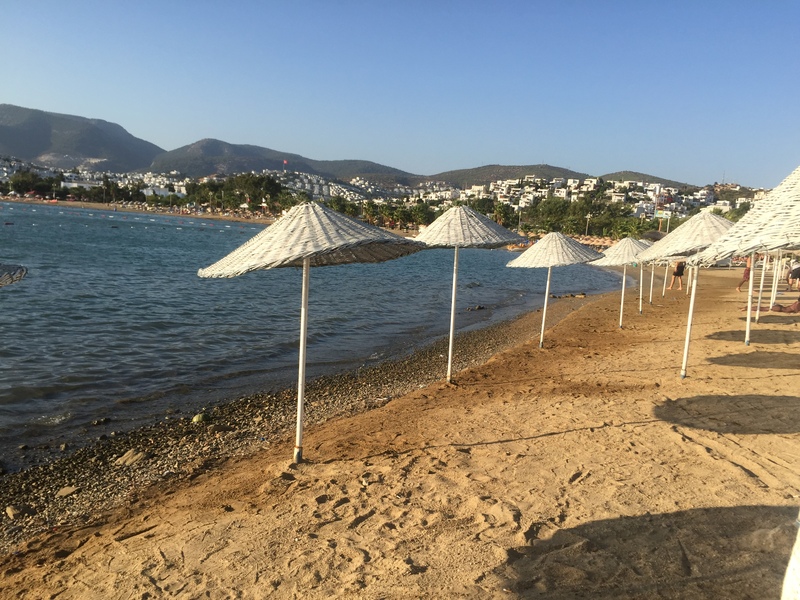 Bodrum is quieter at the end of summer, a little cooler at 30 degrees compared to the crowded peak summer months of June to August when the temperature averages around 34 degrees, the beaches are full and the parties are crazy. 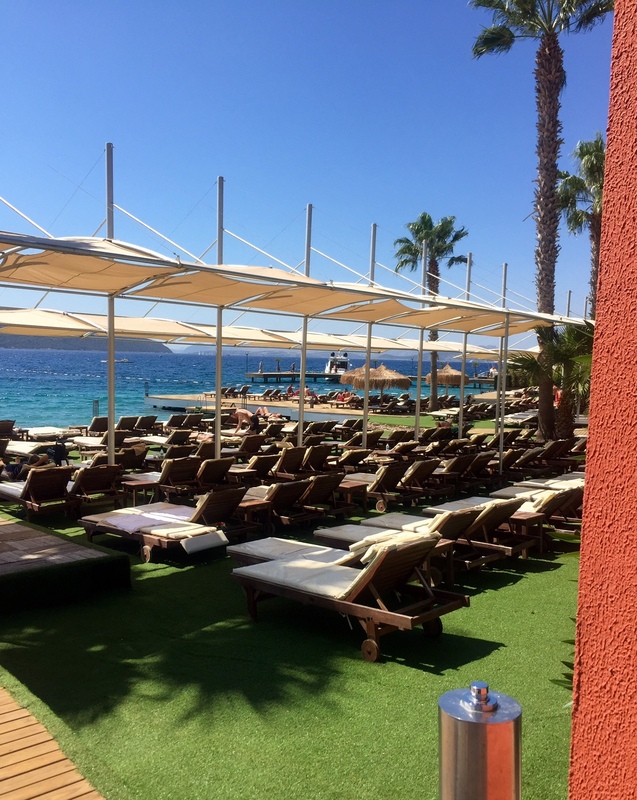 When Sami and I were planning the trip, we decided to split our four days into two beachfront hotels: Hilton Bodrum Türbükü Resort & Spa, which is located in Türbükü Bay, and Ersan Resort & Spa, which is nearer the city center. Most resorts offer full board as did these hotels, because, seriously, once you’re in there you won’t ever want to leave except perhaps to have dinner or go clubbing in town. It’s an unforgettable drive from the airport on the way here — on our left are mountains and hills, and on our right are the deep blue sea and posh white houses hugging the distant cliffs like in Santorini. Our drive feels like we’re in a postcard except the scenery is moving along with us. The bays of Gölköy and Türbükü are only two kilometers apart and form a cove, which makes the Aegean Sea at Hilton calm and perfect for swimming out to sea without having to worry about waves, and to do water sports like jet pack and fly boarding. 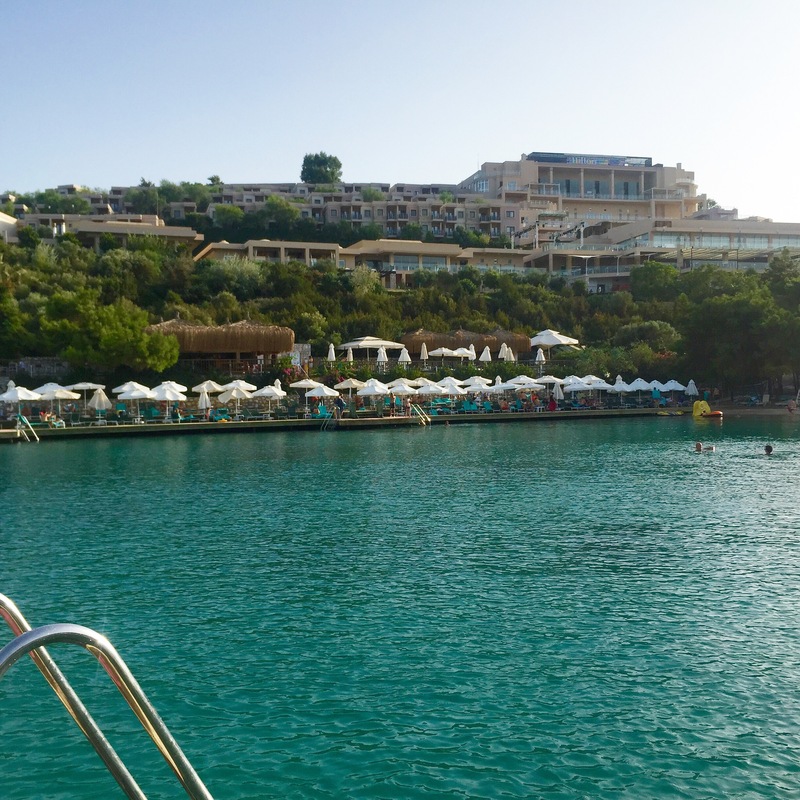 At Ersan Resort & Spa, the water is choppier because it is out on the open sea. On the second day, I muster enough courage to swim with him onto a floating sundeck about 50 meters from the shore (I don’t know how to swim properly, so I tried to simply not drown). A pool ladder leads straight into the Aegean Sea at Hilton Bodrum. With the island shaped like a cove, the water here is very calm. Rows and rows of sun loungers at Ersan. In the height of summer, you wouldn’t find an empty one, which is why it’s probably better to go to Bodrum right before or after summer’s hottest days. Because I live in a country where it’s warm all year round, where we could go to the beach in December or pack an overnight bag on a whim, I never fully understood how people can spend days on the beach tanning, until I realized why. It’s simply because for countries with four seasons, warm sunny days really do have an expiration date. Before you know it, the last days of summer are here and then it’s suddenly too cold for flip-flops and Bodrum has shut down for the season. But lying on the beach with Sami and reading the book he bought me in Istanbul (appropriately enough, Orhan Pamuk’s Istanbul), I am falling deeper in love with Turkey. Oh, how diverse its landscape is, how beautiful its seas and people! Like any European seaside city, Bodrum has a lively tourism industry that attracts both the international jet set as well as domestic visitors. On our second night, we take a walk along the marina, which is the city center. It is actually comprised of only several streets, some of them pedestrianized, which means that traffic and parking can be challenging. The streets are flanked by bars and restaurants at all price points. Souvenir shops offer handicrafts made of seashells, and of course specialty foods such as Turkish delight, baklava, sweets, olives, nuts, and other foods. The best thing we discover on this night is an ice cream place called Bitez Dondurma Waffle, a small restaurant toward the end of the marina which offers 18 flavors of dondurma or ice cream from Bitez. St. Peter’s Castle was built by Christians during the height of the Roman Empire and to protect them from persecution during the rise of the Ottoman Empire. Today, it houses shipwrecks excavated in the Aegean Sea. Photo from wikipedia.com. It may very well be the best ice cream on the Aegean Coast! Flavors range from sour cherry to mulberry, walnut, pistachio, honey and almond, caramel and mandarin. Sami so loved the mandarin flavor that on our last night, after driving all over the peninsula, we went back to the city twice to get ice cream. Apart from Bodrum’s beaches and clubs (Halikarnas being the most famous one), what was once this ancient Greek city also offers culture and history. 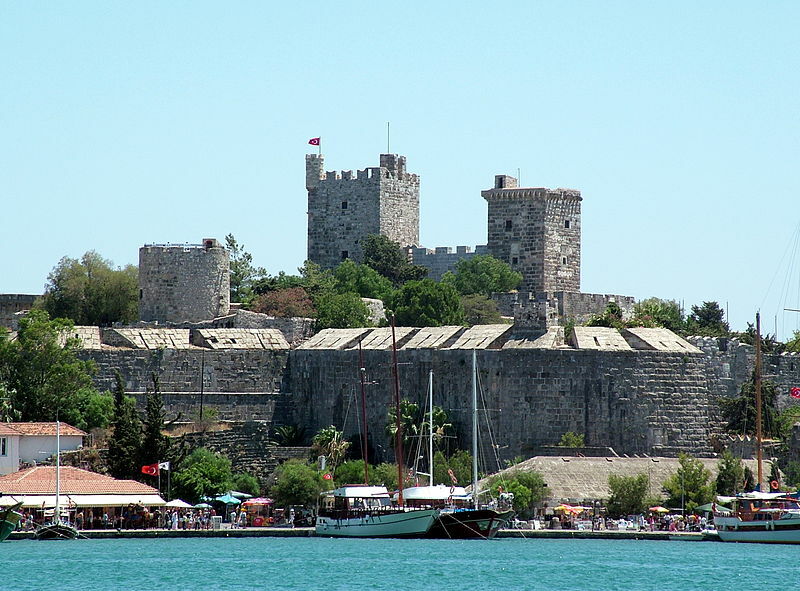 Bodrum Castle, built in the 15th century, was built by the Knights of St. John as the Castle of St. Peter. The funny thing is that the construction workers were granted a “reservation” in heaven by a papal decree in 1409. Enjoying an evening at Bodrum Marina with Sami. The castle was once a refuge for all Christians in Asia Minor, but not long after, it was attacked during the rise of the Ottoman Empire, leading to its fortification. Today, Bodrum Castle is home to the Museum of Underwater Archeology, which displays shipwrecks excavated under the Aegean Sea. Preceding Bodrum Castle was the Halicarnassus or Tomb of Mausolus, which was built between 353 and 350 BC during the Persian Empire. Considered one of the Seven Wonders of the Ancient World, the mausoleum was built by Greek architects. Only ruins remain now, having been destroyed by earthquakes from the 12th to the 15th centuries. The complicated histories of Turkey, Greece and the Roman Empire are woven into the geographical and cultural fabric all over Bodrum and Turkey. You must visit the vestiges of this past to get a better understanding of Bodrum, like the small fishing villages and towns on the peninsula. Topping the list are Gumbet, Gümüslük, Yalikavac, Gundogan and Bitez. Gümüslük is a village which, if you didn’t know you were in in Turkey, you’d think you were on a Greek isle. The colors of the Cyclades islands are here — the bright blues and white and pastels. We are going to Gümüslük for Rabbit Island, famous for its sunset. It’s said that the island was often visited by the King of Halicarnassos, King Mousolos, and his beloved Artemisya to feed the rabbits living on the island and to watch the setting sun. You can actually walk to Rabbit Island across the bay because the water is very shallow and, luckily, we went to other places first and we arrive at Gümüslük just in time for the sunset and some lokma or pastries made of deep fried dough and soaked in sugar syrup or honey, and sprinkled with cinnamon powder or sesame seeds. Breakfast fare at Hilon Bodrum, Bitez ice cream at Bodrum marina, grilled fish at Yalikavak, and Turkish coffee and tea at Hilton. And of Gümüslük’s famous sunset that prodded a king to travel to watch it? It’s a sweet yellow sun that slowly hides behind the hills and mountains, bathing the bay in a soft golden hue as the waves rock the wooden boats on the water — as if to lull them to an early sleep. Crossing back to the main island on foot, with 80 meters of water in between, the tide has risen still only amazingly up to thigh level. Our village-hopping route that starts from Bodrum is an almost perfect oblong. From the city, we dive to Gümbet first, then to Gümüslük, then for dinner we end up in Yalikavak, and pass by Gündoğan on the way back to Bodrum. In between these towns we get lost only once. Gumbet is a short drive from Bodrum City and an alternative to the crowded night scene and traffic of Bodrum. The houses here sit on the hills facing the sea and it has along pubic beach where people can just park their cars across the street and walk over to the water for a day under the sun. The sand is the color of latté and small pebbles wash up on the shore, and again the water is just so clean considering it’s a public beach. 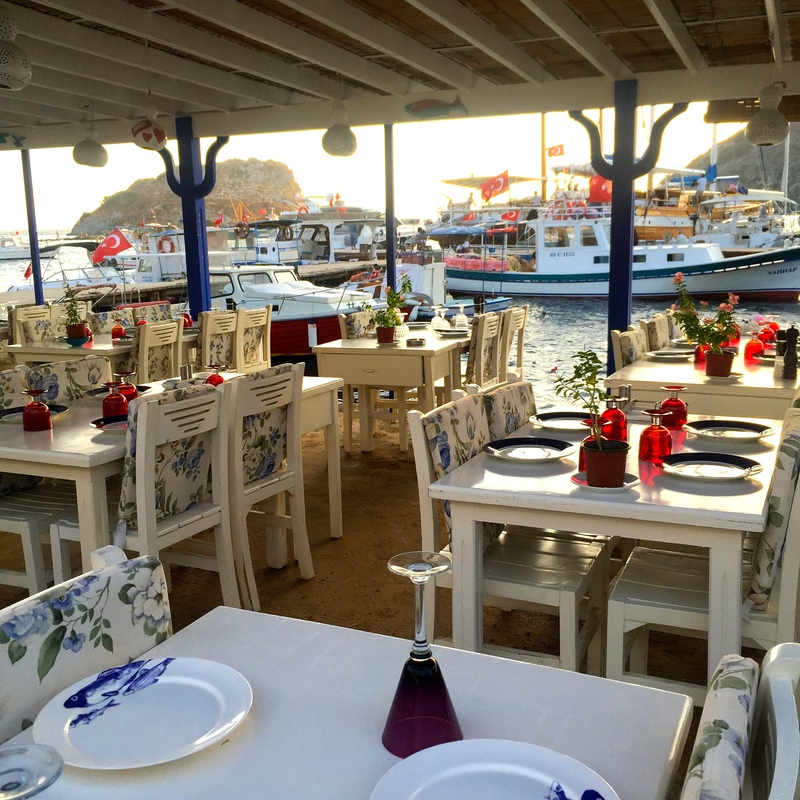 Often called a “miniature of Bodrum,” Gumbet is peppered with restaurants, bars and clubs. Like the other towns on the peninsula, tourist trade is active with boat rentals. Sunset at Gumusluk Bay, belly dancers at Hilton; below, a new season is coming judging by the almost-leafless tree, reading Pamuk on the beach, and buying lokma. After Gümüslük for sunset, we go to Yalikavak for dinner and pass by Gündoğan on the way back to Bodrum. We don’t get off at Gündoğan but it’s worth a visit because it’s an active fishing town known for its snorkeling and diving, and its bay is circled by sunbathing jetties. With a population of only 4,000, Gündoğan is not often on tourists’ itinerary but they say many Turks have vacation houses here, preferring its rural quietness and old-world charm. It also has olive and citrus groves, and pine forests covering the hillsides for hiking. On our last night, we have dinner in a seafood restaurant in Yalikavak Marina. Five feet from our table, the yachts are anchored, and the waiters are throwing leftover pieces of bread to the fish. As a stray dog mills around our table, we are talking about what we would remember most from this vacation — as if we had already left Bodrum. Oh, so many things! There were the unlimited tequila shots at Hilton, the pool we had to ourselves, the fishermen gamely posing for pictures on Rabbit Island, the swimming pools and jacuzzi at Ersan, sitting on the balcony and looking out at the sea, the ice cream from Bitez, the seafood, my being the only Asian it seemed in Bodrum at the time, singing in the car, lying under the sun with a book, and swimming in the sea. My heart is breaking between the main course and dessert because we have to leave this place the next day. Some days, when I am driving to work along Manila Bay and I’m stuck in traffic, I look out to the brackish waters and the reflected sun. I close my eyes for exactly two seconds and try to imagine it’s as blue and as clear as the Aegean Sea, that I am standing in the water and I could see even the tiniest pebbles around my feet. And then in my head, I am transported back to Bodrum’s lovely summer. On the Aegean Sea, looking at the island we soon have to leave behind. I’m glad you enjoyed your trip to Bodrum.